As part of the support we offer our members DrugScope's policy team send out a monthly round-up and précis of reports which we believe are of interest to the field. The following is offered as an example of the content of our Bite-sized Breifing for November. Public Health England (PHE) have updated their 2013 report setting out the current knowledge about levels of infections for people who inject drugs across the UK. As well as the report other resources include an infographic, a briefing for Directors of Public Health and a set of slides. 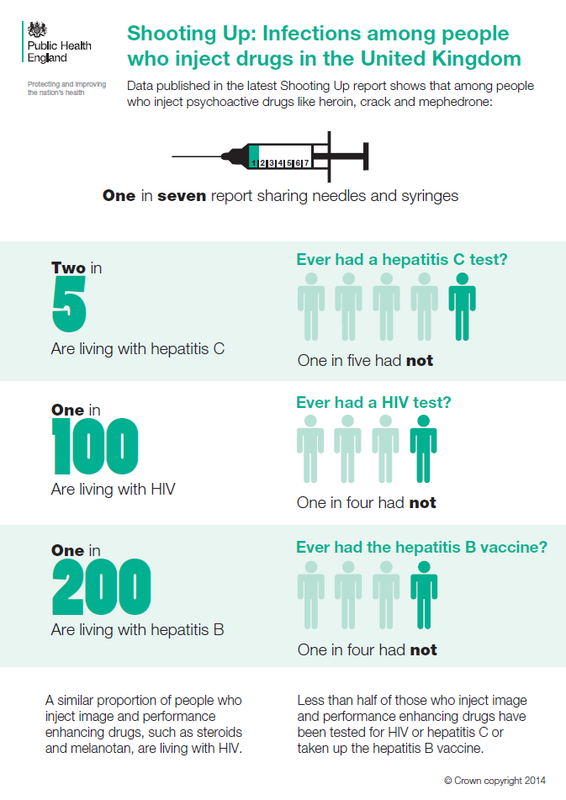 Two in five injecting drug users are living with hepatitis C; half of these infections are undiagnosed. HIV levels remain low and the uptake of care is good. Around one in every 100 people who inject drugs is living with HIV. One in four people who inject psychoactive drugs report a recent symptom of an injecting site bacterial infection. Fewer (one in six) people who inject image enhancing drugs suffer these symptoms. The proportion of injecting drug users who share needles has halved in the last decade but still around one in seven continue to do so and almost one in three had injected with a used needle that they had attempted to clean. There has been a recent increase in the injection of amphetamines and amphetamine-type drugs, such as mephedrone, which is associated with higher levels of infection risks. Perhaps the most important message in the report is that the provision of effective interventions, such as needle and syringe programmes, opioid substitution treatment and other drug treatment, which act to reduce risk and prevent infections, needs to be maintained.